Maria Shriver and Arnold Schwarznegger are mulling a permanent split after four kids and 25 years of marriage. Editor's note: This year the first of the baby boomer generation turns 65. So what can the #Boomers expect in their retirement years? This week CNN will bring you special coverage of this generation. (CNN) -- We have role models for everything. Not that Oscar-winning "Braveheart" director and "Lethal Weapon" actor Mel Gibson counts these days, but before 2009 he had a 28-year-marriage that produced seven children and some respectability. Then he turned his life around. Then there were almost-president Al Gore, and his wife, Tipper, who had 40 years together and had even written a book on how groovy it was to be hitched and then, post-chad, post-Nobel 2010, they said, Oh, maybe not so much on "the death do us part" thing. Now comes word that the deluxe combo pack of "Terminator" star/former California Gov. 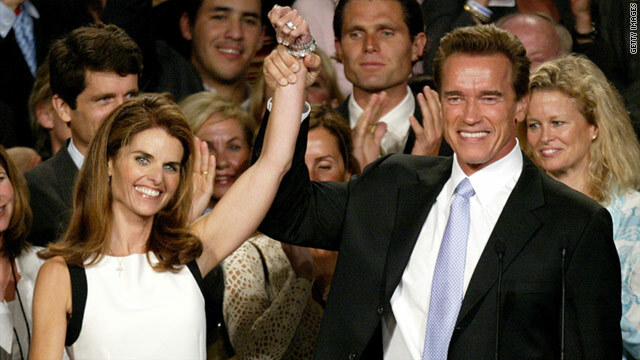 Arnold Schwarzenegger and Kennedy dynasty princess/ex-NBC anchor Maria Shriver are mulling a permanent split after four kids, two accents, multiple political personalities and 25 years of marriage in the high Hollywood-mixed doubles' trenches. What gives? Are we a nation now of Howzabouta Second Chancers, even for those who seem to have gotten a pretty good ride the first time around? Truth is, they can't help their birth years. There is a national predilection of boomers to demand midlife happiness, even if it means they chuck a good portion of the first part of their sort-of eternally vowed adulthood. When asked six months ago by the Pew Research Center, baby boomers even proved to be less enthusiastic about staying in an unhappy union than the adult children they passed their values on to -- by a 66% to 54% margin. In fact, so predictable are boomers on this topic that, in a study done seven years ago, Xenia Montenegro, senior research adviser for the AARP, looked so hard at divorce in people over 50, she darn near "Nostradamused" that Shriver and Schwarzenegger, et. al, were headed for a split. On Tuesday, she said boomers "are leading the way in rethinking of how we get older, just like they led the sexual revolution." But which of the boomers are at risk? Let us be specific. The Pew Research Center's Social & Demographic Trends project published reports in the last year showing that the college-educated are more likely to grow weary of their life partner than those with a high school education. Also, people who marry young are more likely to divorce. And, oddly enough, while those who got married in the 1950s outlasted those in 1960s and those folks outlasted those who married in the 1980s, those who married in the 1970s had the hardest time getting to their 15th anniversary. Montenegro, the author of the AARP's "The Divorce Experience: A Study of Divorce at Midlife and Beyond," said these couples have waited nicely until their kids were out of the house, saw an opportunity to separate and "have their me time." Women initiated two-thirds of the divorces in Montenegro's study. Baby boomer women realize how different they are from their mothers and how much longer they are going to live and that they can support themselves. They felt more free to look after their own happiness. "Even their children want their parents to be happy," Montenegro said. "It's a redefinition of retirement," she said, with the caveat that lower-income groups can less afford to seek divorces and are less able to weather divorces in separate households in financially difficult times. Sandra Bonfiglio, a divorce attorney in Fort Lauderdale, Florida, said she's seen those who are anxious "to reconnect but had trouble doing it. They have nothing in common by then and can't find each other." The surprise for those couples, she said, is that -- while it should be easy when there are no custody issues and for couples with two incomes, no real money issues -- "divorce is never easy." A marriage therapist in Hyannis, Massachusetts, told the story Tuesday about an old New Yorker cartoon depicting an extremely elderly couple seeking a divorce. The judge asks, "Why now?" The old woman answered: "We wanted to wait until the children died." The therapist laughed at the joke and said, in reference to boomers that, maybe, there wasn't anything new here. But there is. According to the Office for National Statistics, the rate of divorce is dropping in every age group, except the over-60s. Don't ask us to quantify or explain the need for a trophy wife. Life is just complicated sometimes. Which brings us back to Shriver and Schwarzenegger. Stuart Bloom, a licensed marriage and family therapist in Laguna Beach, California, warned not to think of those two as representative of an entire movement of baby boomer masses yearning to breathe free. "They are unique," Bloom said. "Their circumstances, as individuals and a couple, are unlike anyone else's." And yet Bloom said he worked his way through graduate school and an internship at the University of Southern California by being a waiter at the famous Café Figaro in Los Angeles. He often waited on Schwarzenegger in 1977 around the time of his breakthrough debut in "Pumping Iron." "He was very kind to me," Bloom said, which unexpectedly prompted this remark: "People are people, and in this marriage, feelings are feelings. That is what is not different in this separation and that should be respected." What plagues baby boomers? Boomers are less healthy and heavier than their parents were at their age. Different sources use varying dates to mark their beginning and end of generations. They are both baby boomers and still living their dreams, but only one of them is feeling secure about retirement. Don't expect baby boomers to go quietly into retirement. Expect big changes from them instead. Another iconic boomer couple representing "I'll love you forever" has decided ... "maybe not."